The Missouri River is one of the longest rivers in the world, and most have heard it’s name. Trout fishermen are mostly concerned with the 35 mile section below Holter Dam near the towns of Wolf Creek, Craig and Cascade. This “tailwater” section offers some of the finest fly fishing in the Western US, and is a destination for fly fishermen and women from all over the world. 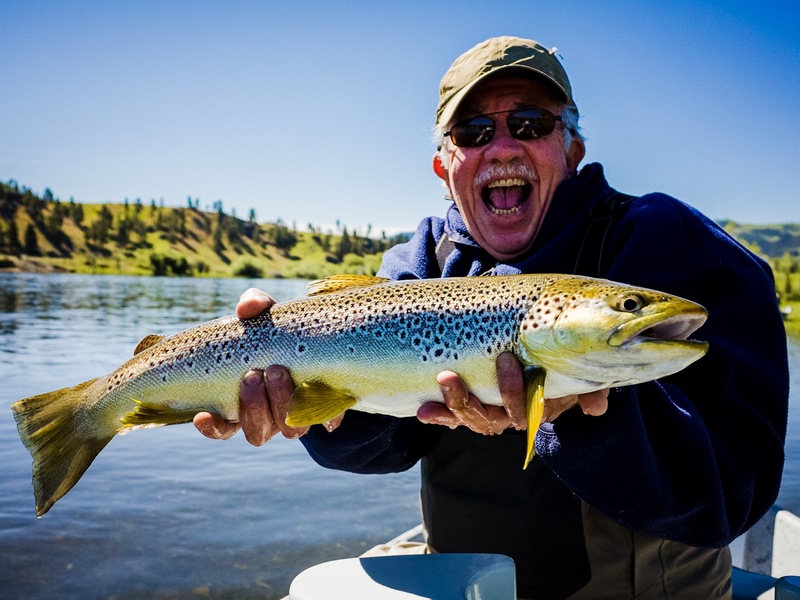 One of the most popular trout fisheries in Montana, the Missouri River continually produces some of the best fishing in the state, and arguably the largest average fish size. Cycles in fish size and quantity do change from year to year, but the fishing remains phenomenal by anyones standards year after year. While all methods produce on the Missouri River, it is most famous for it’s incredible dry fly fishing, which stretches from April through November. Caddis and Mayfly hatches can reach intensities that bring every fish in the river to the surface. When hatches thin or weather does not permit dry fly fishing, indicator nymph fishing is world class, and size and numbers can sometimes be mind-boggling. During the spring and early summer anglers seek big fish tight to the bank with gaudy streamers. During the off or “swing” season, two-handed fishing with ultra-light spey rods has become the go-to method on the Missouri River. The Missouri River fishes at all times of the year. Methods vary, and certain times are better for certain methods. If you’re a dry fly geek, we recommend April, May, July and October. If you love to rack up big numbers on nymphs, we think May, June and September are the primo months. If large foam attractors are your style, July, August and September should be your focus. If you don’t much care – but don’t like crowds – we think March, late-August and November are tough to beat. And you just might find world class dry fly fishing during those months. During the winter, we switch to spey rods and experience some of the best trout-swinging around. The Missouri is rarely affected by runoff – and even when it’s high and off color, we get ’em – so no matter when you come, you’ll find good fishing. How you want to catch them should dictate the “when” for you. During the winter, you can keep up to date with snowpack and runoff forecasts at our blog and fly fishing report for the Missouri River. The access isn’t good, it’s great! The state of Montana has a dozen Fishing Access Sites (FAS) and combined with Montana’s liberal stream access law you can walk to most of the river. The most important wading access, however, is provided by the Sterling Ranch on the upper river, and the Anderson Ranch on the lower river. Both have agreements with the state that allow miles of bank access to some of the most productive stretches of the Missouri River. And the wading? Well, it doesn’t get much easier than the Missouri. A fine gravel covers the bottom of much of the upper and lower river. The gradient is shallow so heavy currents are not an issue, though high water periods in June and early July can make the wading near impossible and dangerous (flows above 6000CFS). The middle or “Canyon” section of the river does have a cobble bottom that is more difficult to wade, but nothing like the greasy boulders found on other montane rivers. While guided anglers generally are going to catch more and bigger fish than non-guided anglers, the biggest difference will be what you learn, not what you catch. For those who desire to learn as much as possible about holding water, casting techniques, fish behavior and hatches, we definitely recommend hiring a guide, even if only for a day. On the other hand, we encourage all of our customers to get out and fish on their own. Problem solving is critical, and that process happens when you’re by yourself. The Missouri River offers great access, easy floating and excellent hatches. A perfect recipe for the DIY angler, even if they are unfamiliar with the Missouri River. Many of our customers do both. By hiring a guide for the first day or 2, you’re getting some great advice on current hatches, sections and techniques. You’re also ensuring a couple of easy and successful days. Now that you’re “in-tune” with the river, go ahead and give it a go on your own. 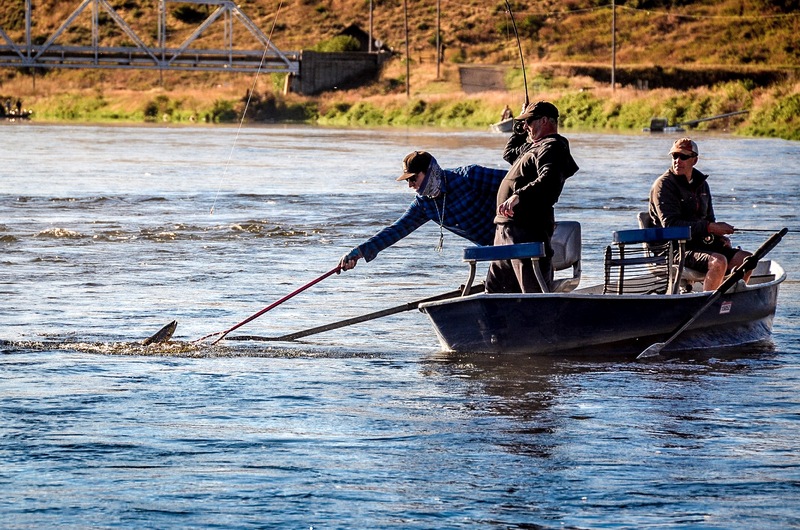 Fly Rods for the Missouri River are typically 9′ 5 weight, fast action rods. Most of our fishing involves technical dry fly or indicator nymph techniques. Powerful but lightweight rods are needed to make long, accurate presentations in the ever present wind. Weight-forward floating lines with the energy to push through the wind are preferred for most Missouri River dry fly and nymph situations. Match it to your rod or “line-up” if you like it that way. We occasionally use sink tips for streamer fishing, and of course spey lines on our two-handed rods. The Missouri is big and wide, and the trout run fast and far. Reels with quality drag systems and 50+ yds of untangled backing are required. Lightweight breathable waders are preferred during spring and fall months (we use Simms Waders). From mid-June through September, we typically wade “wet”, wearing shorts or quick dry long pants. Wading boots need not have cleats. The Missouri River is very easy wading with a flat bottom comprised of small gravel in most places. Mo’ regulars usually use non-felt soled wading boots, and river sandals during summer months. The Missouri River has some of the best access and easiest wade fishing in Montana. FWP Fishing Access Sites are scattered through the canyon from Holter Dam to the town of Cascade. The Sterling Ranch near Craig allows public access for fishing. On the lower river, the Anderson Ranch Co. allows the same. Wading is super easy. Leave your cleats and staffs at home. Rental boats are hard to come by on many western rivers. But the easy flows, soft bottom and lack of rough water make the Missouri River an ideal spot to rent a drift boat. Headhunters rents Adipose Drift Boats and NRS Freestone inflatable drift boats. Rentals are very popular and reservations should be made in advance. 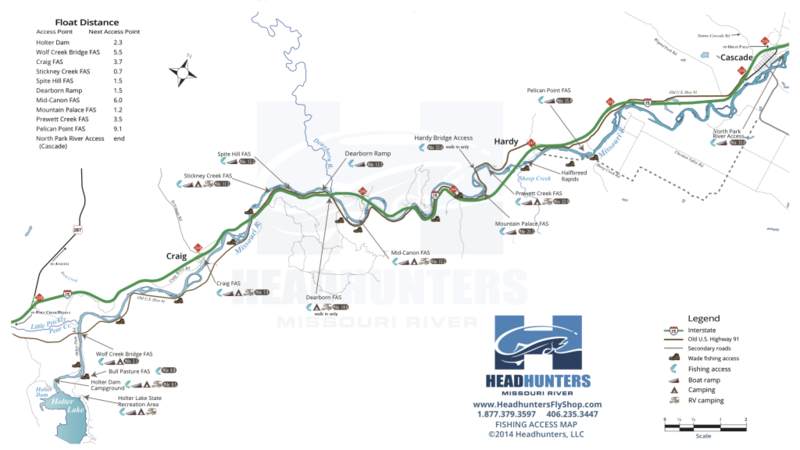 Headhunters offers a full time shuttle service, and is the only service that does evening shuttles on the Missouri River. We can shuttle your vehicle anywhere between Holter Dam and Cascade. Please feel free to give us a call or drop us an email with any questions you have about hatches, times to come, access, lodging or anything else that will help you plan your trip to the Missouri River. Our professional staff fishes every day. They know what’s working and what’s not. Missouri River Montana FLy Fishing. That’s what it’s all about! Finding lodging on the Missouri River can be difficult at peaks times. Headhunters offers the largest selection of accommodations on the river, though there are other options. Craig is the most popular area, and our cabins fill quickly and a year in advance. Most lodging in the canyon is limited to home rentals, but there are some smaller motels in Wolf Creek and Cascade. You can also choose to stay in Great Falls or Helena, with of which have many hotels and restraints to choose from. Camping is very popular on the Missouri River, but don’t expect a “wilderness” experience. Most campsites are at State of Montana Fishing Access Sites (FAS), and will see their share of late night partying, some road noise, and boat ramp traffic. But, they’re fun places to stay and you’ll meet anglers from all over the world! All have outhouses, but none have water or garbage (pack-it-in/out). If you’re looking for RV hook-ups, you have options at Headhunters, the Sterling Ranch, Mid-Canon, and Prewitt Creek. Because there’s not much else to do around here besides fish, eating & drinking are very popular activities. The most popular dinner spot in the area is Izaak’s Restaurant in Craig, which serves incredible BBQ, amazing steaks as well as seafood and pasta specials. Izaak’s has an excellent wine selection and full bar that is a popular after fishing hangout for both guides and anglers. The Oasis and the Frenchman & Me in Wolf Creek are the other two dinner spots in the area. The only breakfast in Craig is the “stand-up” style. To-go burritos, breakfast sandwiches and cinnamon rolls can be had at Papa’s burger stand right on Bridge Street, or at the trout shop. If you want to sit down, you’ll need to head up to the Frenchman & Me in Wolf Creek. Nearly everyone is eating lunch on the river, but if you do find yourself in Craig and need a bite head over to Papa’s for a burger, taco and some Huckleberry ice cream. After dinner, most folks head on over to the legendary Craig Bar, known to many as “Uncle Joe’s”. Great bartenders, drinks, juke box, and thick with local flavor. So what’s Craig Like? Well, we are a laid back community of hard-core anglers, many of whom are under 40. We love to fish, and we’re not afraid to stay up late and enjoy some post-fishing beverages. Izaak’s Restaurant and Joe’s Bar are two favorite hangouts, and you may find us enjoying a shot of Fireball and a cold beer within. “Quaint” and “peaceful” aren’t words we use to describe Craig. It can be a little rowdy, but it’s still kid friendly. There’s nothing to do but fish and enjoy the river, so you can leave your golf clubs at home. Don’t expect too much. Just great fishing and people.